Hammock Preserve is a resort-style residential development set up in the 7,500-acre Palmer Ranch master-planned development. Marketing of properties in this subdivision commenced in the first quarter of 2016. It came part of the wave of new Palmer Ranch homes for sale that emerged in the housing market’s recovery after the Great Recession. The development of Hammock Preserve homes for sale came at a very opportune time. Its main access road, Honore Avenue off west of this community, was extended in 2015 south to Laurel Road. This extension, in effect, not only created an unbroken road corridor alternative to Interstate 75 towards northern Sarasota and Manatee County. It also linked up with the east–west Laurel Road and with the southern stretch of Pinebrook which opened a new access route to south Sarasota County as well. Work is likewise underway for the extension of Honore Avenue westward to Bay Street for a more convenient and shorter trips to Osprey. All these road infrastructure improvements, local real estate agents believe, will help draw more families to Hammock Preserve and its surrounding communities. The vastly improved mobility around Hammock Preserve, however, is just one of the selling points for Palmer Ranch homes for sale here. The developer of this community, the DiVosta unit of top national builder Pulte, has also lined up many exciting amenities for its residents. 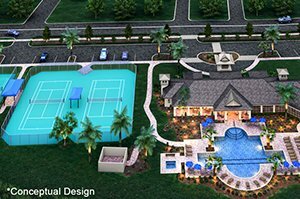 DiVosta is providing Hammock Preserve with a spacious clubhouse, a fitness center and a resort-type swimming pool. 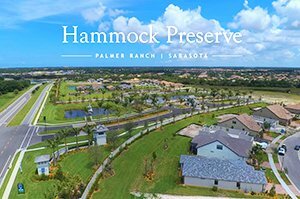 Hammock Preserve homes for sale likewise draw market strength from other community facilities, such as tennis, pickle ball and bocce ball courts. Additional perks of living in this new neighborhood include a dog park, creeks, lakes, ponds and patches of forest preserves that do justice to the subdivision’s name. As enticing to prospective buyers, Hammock Preserve on Palmer Ranch also banks on DiVosta’s solid industry reputation of building consumer-inspired homes. Like all Pulte units subscribing to this tack, DiVosta seeks inputs from prospective home buyers in generating the designs of its “life-tested” residences. The parameters used in this exercise range from the site plan and home layouts up to amenities. For the Hammock Preserve, the general home design theme revolves around an open concept with living space most conducive for entertaining. There are seven distinct home designs to choose from in this community, which range in floor plans of between 1,500 and 2,900 square feet. These come in layouts of two to five bedrooms with two to four baths and priced from the $300s up to the $600s. The homes for sale at Hammock Preserve would appeal to a wide range of tastes and preferences. DiVosta’s residential designs for this community typically are the styles sought by families and single professionals as well as property investors and seniors who look forward to an easy lifestyle after retirement. Expect to be dazzled when touring any of Hammock Preserve home for sale. 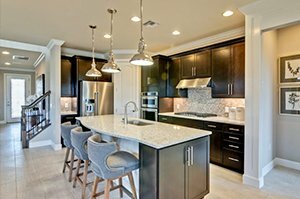 Their typical features include stainless steel appliances, maple cabinets and quartz countertops signature to DiVosta builds now amongst the expanded choices of homes for sale at Palmer Ranch. Below are the current real estate listings available at Hammock Preserve on Palmer Ranch.